The Hazardous Devices Unit, known informally as the Bomb Squad, is one of only 13 bomb squads in the State of New York and is accredited by the Federal Bureau of Investigation. Comprised of highly skilled and exceptionally trained technicians, the members of this unit respond to calls for service that include: possible improvised explosive devices, bomb threats, military ordinance, volatile chemicals, deteriorated explosives and dangers fireworks. 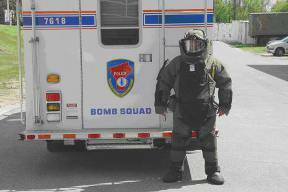 The Bomb Squad utilizes specialized equipment to approach, inspect, disarm and/or remove all types of explosive devices. Bomb Squad members are adept at examining explosive devices in order to identify persons responsible for the devices’ manufacture. Follow-up investigations are an integral part of the Bomb Squad function. Unit members are trained in advanced post-blast investigation. The Bomb Squad assists local jurisdictions in evidence gathering and crime scene processing. A considerable amount of time is spent analyzing data generated from explosive device investigations. Assists the Federal Bureau of Investigation and the Bureau of Alcohol, Tobacco, Firearms and Explosives in providing regional counter-terrorism training to local first responders. Conducts numerous training sessions and seminars on bomb and bomb threat procedures. In addition to expertise in handling explosive devices and materials, HDU members are trained to handle incidents and devices that involve chemical, biological, radiological and nuclear materials.